When we saw that you cold buy a sleeping bag that looks like a bear, our first thought was AWESOME! 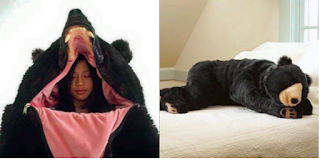 You could definitely scare the crap out of people with that nifty sleeping bag, BUT as we learned WHY the bear was created our hearts started to melt. The sleeping bear was a tribute to a brown bear that travelled the Italian Alps in 2006. The bear, named Bruno, was the talk of the surrounding towns as he would wander near people. The poor thing was then hunted out of fear. The sleeping bag art piece (all yours for a small fee of $2,500) is meant to represent the relationship between mankind has with nature.